In previous editions of this The Innovator newsletter, we’ve noted that maintaining energy and productivity around innovation often requires a balance between opposing forces – forces that both spur creativity and can cause friction (with both internal and external stakeholders). The same applies to today’s question, “How do you find the big bold ideas that matter in the market and to my company?” The main balance in this domain of innovation is focusing on a significant unmet need or problem while at the same time being open to unexpected new opportunities or changes of course. Some people might react with skepticism to this question: “If we knew what the big opportunity was, we’d already be insanely rich.” In answer to this, we would certainly confess that we don’t have a crystal ball to predict the future; however, we do have an approach that will increase your chances to find that big idea. This goes hand in hand with having a well-functioning innovation portfolio, which is the mechanism to keep a wealth of ideas flowing so that the market sees that your company is consistently finding new ways to meet unmet needs. In this newsletter, we’re going to drill down into that innovation portfolio and look more closely about how a few ideas – or sometimes just one idea – comes to fruition. The first and by far the most important step in this process is having a clear goal. We might better understand why this is important if we recall this criticism of Aaron Burr in the recent musical Hamilton: “If you stand for nothing, Burr, what will you fall for?” Essentially, having a clear goal to work towards gives participants in an innovation process parameters and reference points concerning what is germane to satisfying a customer need. Those parameters allow insights to accrete instead of becoming dispersed and incoherent. For example, if the goal for a yogurt company was a vague mandate “to increase sales,” then just about any and everything related to the existing company’s efforts might be included in that goal. Better salespeople? (Sure.) Bigger containers? (It might work.) Lower prices? (Why not?) But if the goal is more specific, like “how can we increase and broaden the ways consumers think about to using yogurt,” then the insights connected to that goal have far more potential to be related and to grow into something like a meaningful idea. In accomplishing the second step in this process, we don’t advocate any one method over another: it depends on your company and its culture. Whatever the method, you need people or systems (or some combination) that have responsibility for gathering and assessing ideas. A couple of brief examples may help visualize this step. People-oriented example. A company may task large cross sections to be on the lookout for new ideas and emerging or disruptive trends in the business environment. Teams or individuals are then in place who are specifically accountable for sourcing and managing emerging trends in their fields of endeavor. Eventually, these teams or individuals assess these insights and decide whether or not they should be terminated, undergo more testing, or should enter the pipeline of new offerings or product development. Systems-oriented example. To start generating insights, you can hold workshops and ideation events, invite online submissions and talk to customers. In processing these new insights, you should cross-reference them with existing and past efforts. By doing this you can avoid reinventing the wheel by eliminating “new” insights that have already been assessed. You can also find current innovation efforts that might be given an extra boost of energy by a connection to a new insight. 1) The category will not satisfy the unmet need. 2) The category will satisfy the unmet need (maybe with some minor modifications). 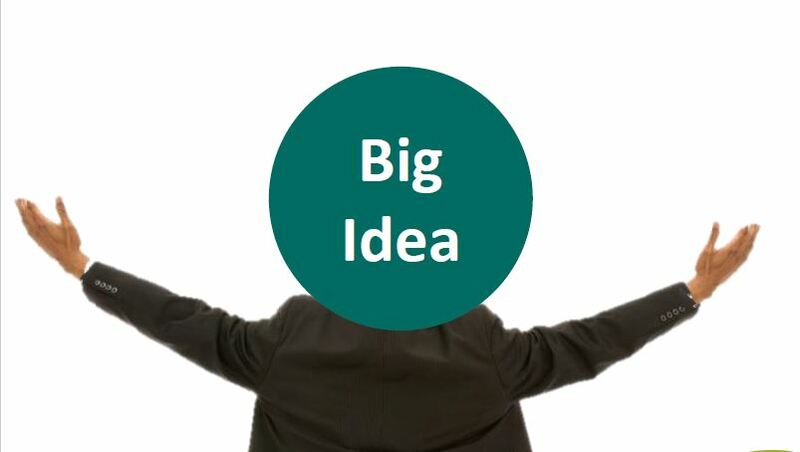 This is the foundation of the big idea. 3) Testing of this category might yield insights into another way to satisfy the unmet need. 4) Testing of this category reveals a new unmet need – which requires beginning this process again. This approach represents an efficient way of processing insights. While relatively simple and straightforward, the process is made robust and coherent by being consistently measured by its ability to satisfy a specified unmet need. Meeting that need in a way that leverages different parts of the value chain will likely yield a big bold idea. Almost equally important is to be on the lookout for surprises and new insights that can lead to the discovery of a second unmet need, which was found (somewhat ironically) because of the focus on the first. This brings us back to the first step of the process and the beginning of another potential blockbuster. We all know that big bold ideas don’t come easy and that innovation (especially for internal stakeholders) is more a marathon than a sprint. Outside stakeholders may marvel at the speed and quantity of business concepts emerging from your company, but insiders know that those new entries into the market represent a fraction the overall effort and insights that their company was investigating and testing over a long period of time. Helping employees to run that innovation marathon is a big challenge. One answer to that challenge is the appointment of a Chief Innovation Officer. Examining the pros and cons of having a CIO is the subject of next month’s newsletter. We should take one moment here to explain what is meant by the word “idea” in an innovation process. An idea that is worthy of the name in an innovation process usually comes towards the end of that innovation process because it deals with the interlocking parts of the value chain that have to work together to create an innovation that’s successful because it is hard to imitate. Smaller insights or incremental improvements within a link of that value chain are better understood as the younger cousins of a fully-fledged idea: suggestions, insights and hunches. We often call them “idea fragments.” For instance, an R&D researcher at a food processing company might have a hunch that making a richer version of an already existing brand of yogurt might satisfy a segment of their customer base. This incremental step may indeed increase the loyalty of existing customers and perhaps attract a few new ones, but it doesn’t represent the creation of a new business concept that grows from new set of interlocking links on a value chain. In the example above, competitors could imitate the creamier version of this yogurt relatively easily. Categories could represent groupings of idea fragments that meet an unmet need. If an unmet need for yogurt consumers was finding more ways to integrate the health benefits of yogurt with other foods, the categories of suggestions could range from seeking ways to partner with other food companies and restaurants to educating consumers on how to use yogurt in a variety of foods and meals. Because the categories are related to a goal, they can sometimes be combined in a final idea. Mark Rennella is a writer, editor and teacher who uses a historical perspective to examine and unpack today’s complex business trends. He has authored popular Harvard Business School cases on a variety of topics as well as a book on leadership, Entrepreneurs, Managers and Leaders, co-written with Nitin Nohria and Anthony Mayo (Palgrave Macmillan, 2009). Mark’s many books, articles, business case studies, and collaborative writing endeavors have garnered him critical praise from historians, academicians, and business leaders alike. In 2001, Mark earned a PhD in American History at Brandeis University. Dr. Hitendra Patel is the Managing Director of the IXL Center and Chair of the Innovation and Growth Program at the Hult International Business School. He has coached new emerging leaders and managers of new and fast growth businesses.Hitendra was a senior leader and co-founder of Monitor Group’s Innovation Practice and was responsible for Asia and Latin America. Prior to Monitor, he was a senior manager at Arthur D. Little. As a management consultant, he has made lasting impact with all types of companies by helping them identify new engines for growth and develop their own capacity to innovate. IXL CENTER Newsletter, October 2018 What innovation processes and tools are key to institutionalize innovation across all parts of your organization?